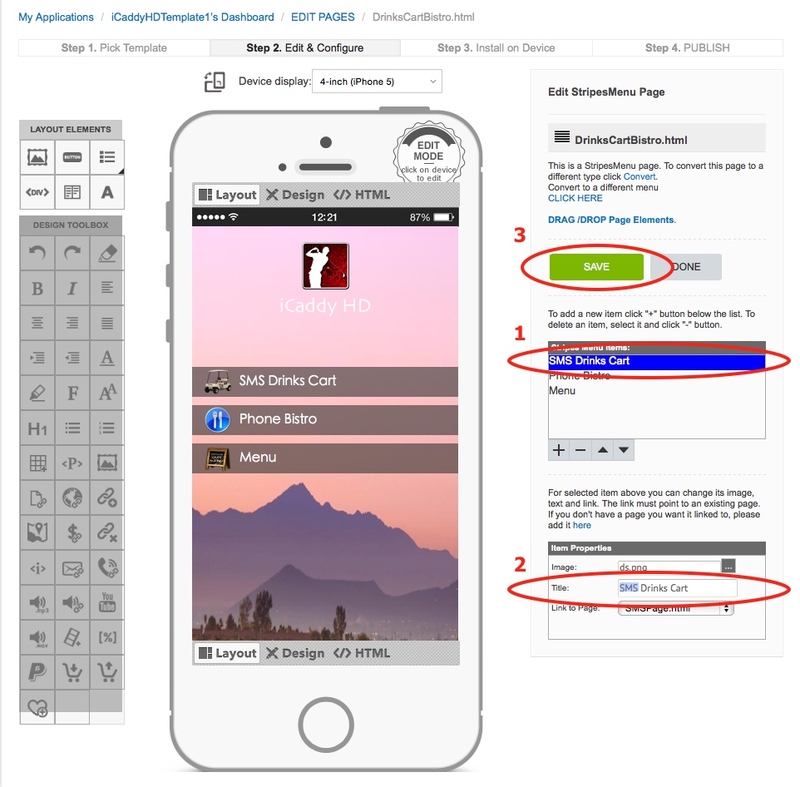 For this tutorial you will select one of the three 'iCaddy Plus' template versions on the second page of the templates list. Step 16 - Edit Drinks Cart Links. SMS is set by default and only requires you to edit the preferred destination telephone number. To do this, edit the 'SMSPage.html' page by clicking 'Edit' (as shown below). This is done by editing the link associated with the drinks cart button on the 'DrinksCartBistro.html' page. Select the 'DrinksCartBistro.html' from the page list. Click 'Edit' (as shown in the image below), to open the page for editing. The first step is to change the text that appears on the 'SMS Drink Cart' button. Select 'SMS Drinks Cart' in the 'Stripes Menu Items' list (per (1) below), then edit in the 'Title' field in the 'Item Properties' section (2). Change the text from 'SMS Drinks Cart' (default) to 'Phone Drinks Cart', or 'Call Drinks Cart' etc. Click on the (retitled) 'Phone Drinks Cart' button on the 'Handset Display' (2). The 'Element Editor' will open. 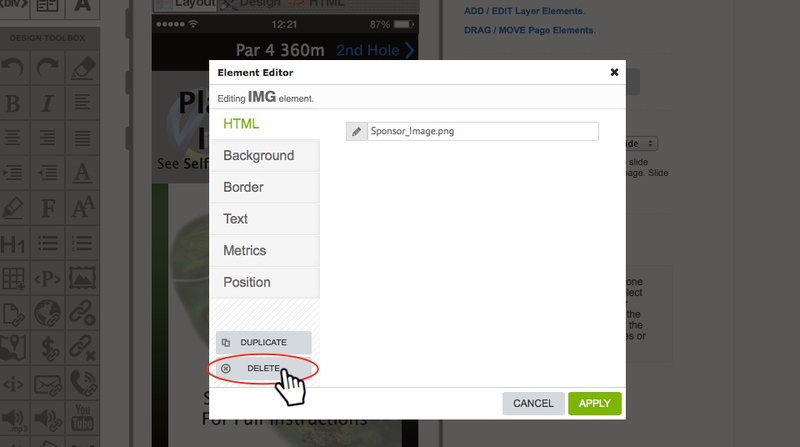 Click 'APPLY' in the Element Editor (9) to return to the 'Edit Pages' screen for the 'DrinksCartBistro.html' page. Click 'SAVE' (10). The food order page (DrinksCartBistro.html) contains the restaurant / bistro menu for your Club and a link to contact the restaurant. The Club's restaurant menu can be added as a single image (by editing the relevant button on the DrinksCartBistro.html page). The menu image is added the same way as a hole map image is added to your App. 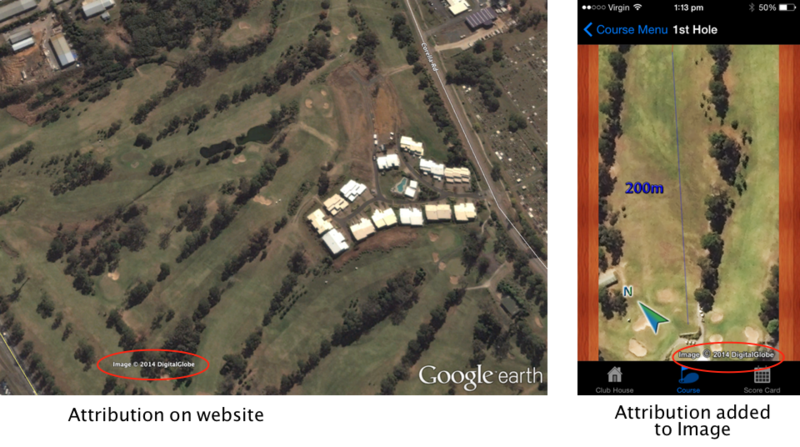 For information on how to add an image, go to How to Edit Hole Map Images. The link to place an order can be via telephone or SMS. A telephone link ('tel') is set by defult and only requires you to edit the destination telephone number that you wish to use. 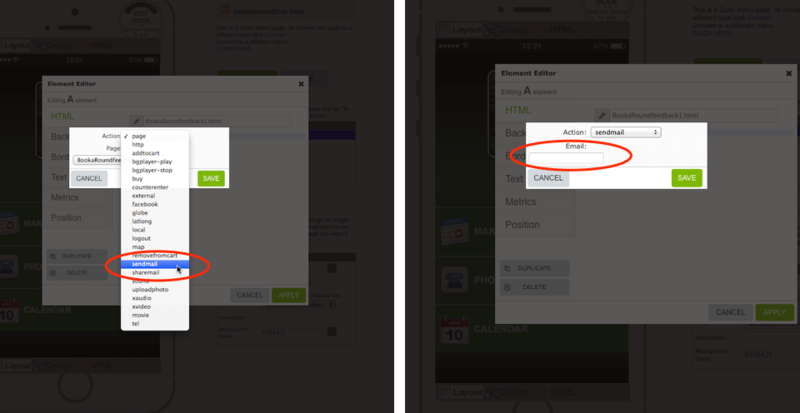 For information on how to edit the 'Phone Bistro' button, go to How to Edit Phone links. You can also change the link from a telephone link (set by defult) to an SMS link if preferred. 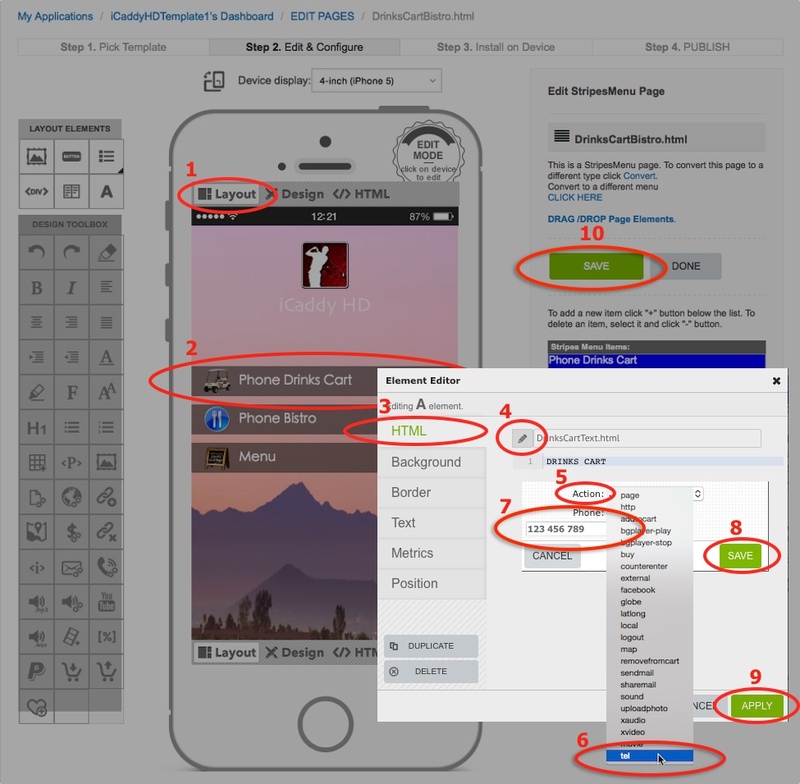 Navigate to the relevant page (DrinksCartBistro.html) and click on the 'Phone Bistro' button on the handset display. The Element Editor will open. Select the 'HTML' tab on the left hand side of the Element Editor. Click on the 'pencil' icon to open the 'Action' dialogue box. The Contacts page (ContactsPage.html) contains the contact information for your Club including links to social media sites. This page also includes an in-app internet browser link (i.e. Google Search button). There are two links that are edited directly from the 'Contacts' page - the telephone link and the map link. For information on how to edit the telephone link, go to How to Edit Telephone Links. For information on how to edit the Map link, go to How to Edit GPS Links. The other links on the 'Contacts' page are edited via their individual pages. The Facebook, Twitter, Email and Website links require the correct address information to be entered (i.e. 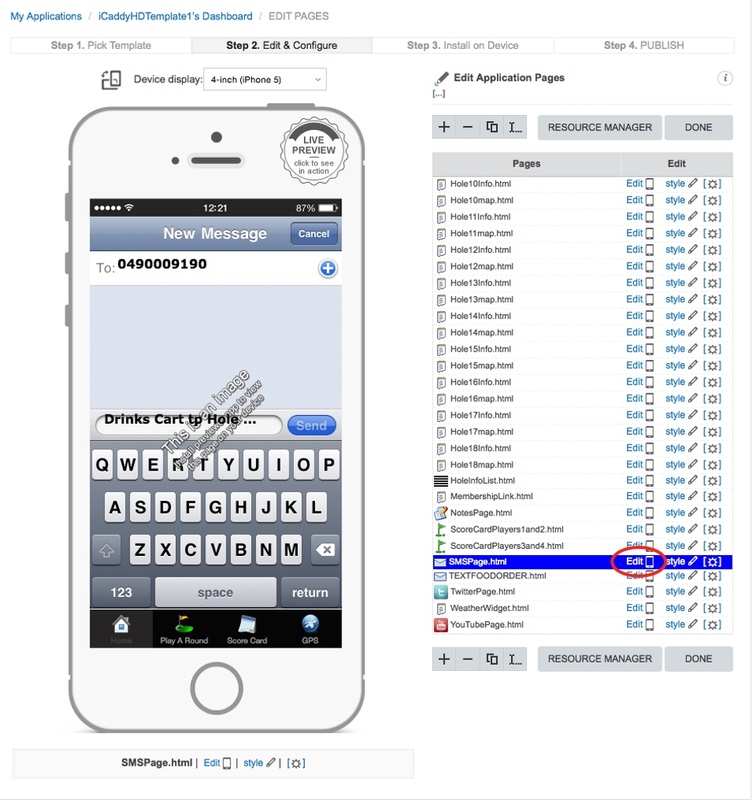 email address or URL) on the relevant App pages to enable these features. The 'Google Search' button does not require any editing (it will simply open a default Google Search page on your device's browser when tapped). 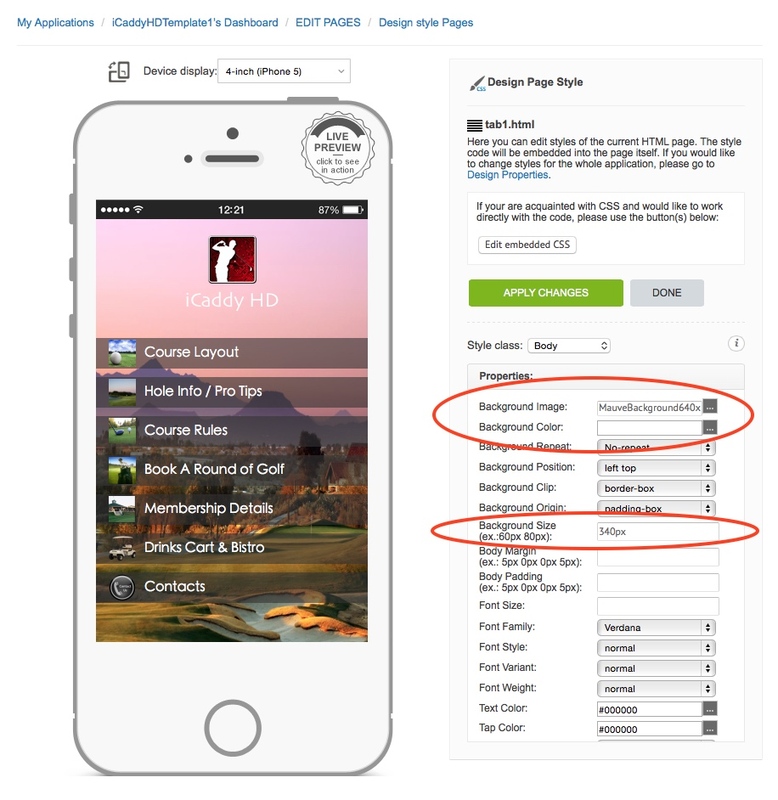 The Membership page (MembershipLink.html) contains membership details for your Club. Alternatively, you can link the 'Membership Details' button on 'tab1' directly to the membership information on your Club's website. For information on how to add a web link to this button, go to How to Use the Element Editor. Step 22 - Weather Page. 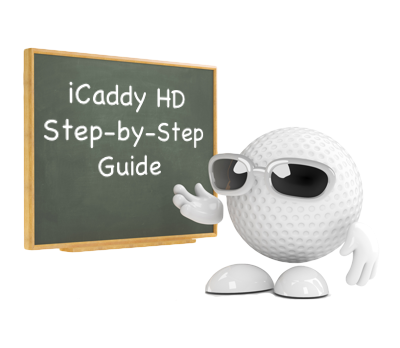 iCaddy HD includes the ability for your Club to incorporate local weather information into your App. Weather information is accessed from a button on 'tab2.html' (i.e. 'Play a Round)'. Step 23 - Audio File Settings. iCaddy HD incorporates sound snippets (i.e. audio files) when sliding (swiping) between the 'Hole Map' pages and also when sliding between the 'Pro-Tip' pages. 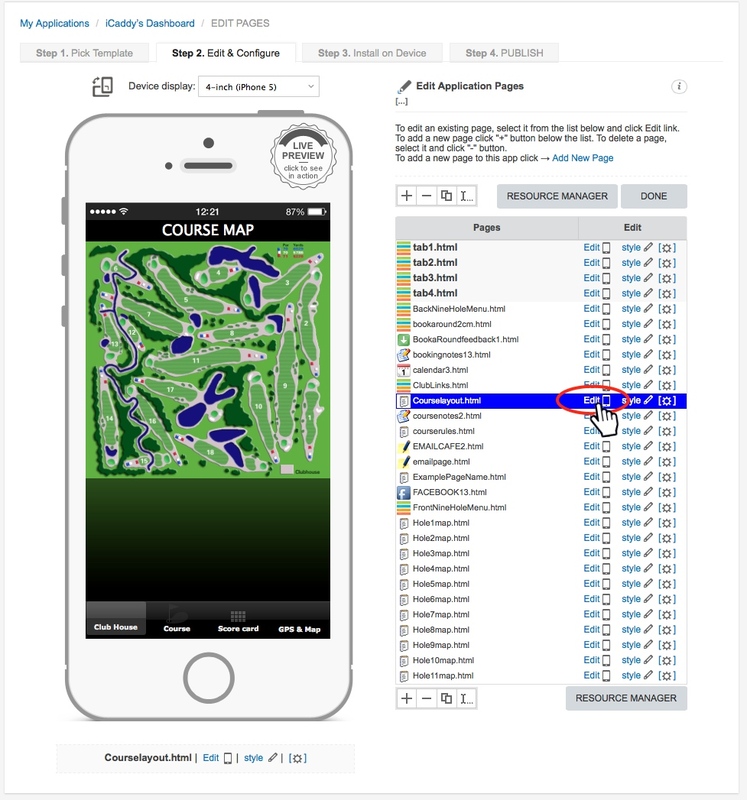 The sound of a tee-shot is played when the App-user swipes from one 'Hole Map' to the next. The sound of a golf ball dropping in the cup is played when sliding between 'Pro Tips'. Club's can change the audio file played, or remove this feature	if preferred. This feature is edited via the 'FLICK' tab in the 'Page Settings' for the App. To access these settings, click 'Page Settings' from the App's Dashboard, then click on the 'Sound' field for any page and simply add your preferred audio file. 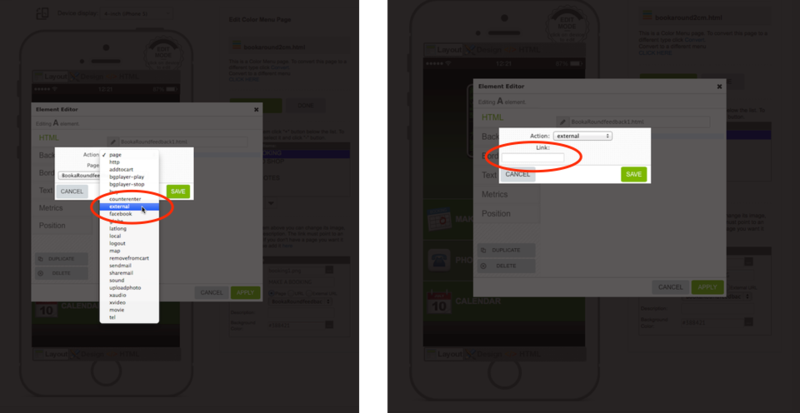 For information on how to edit the 'Flick' settings in your App, go to Page Settings (Flick). 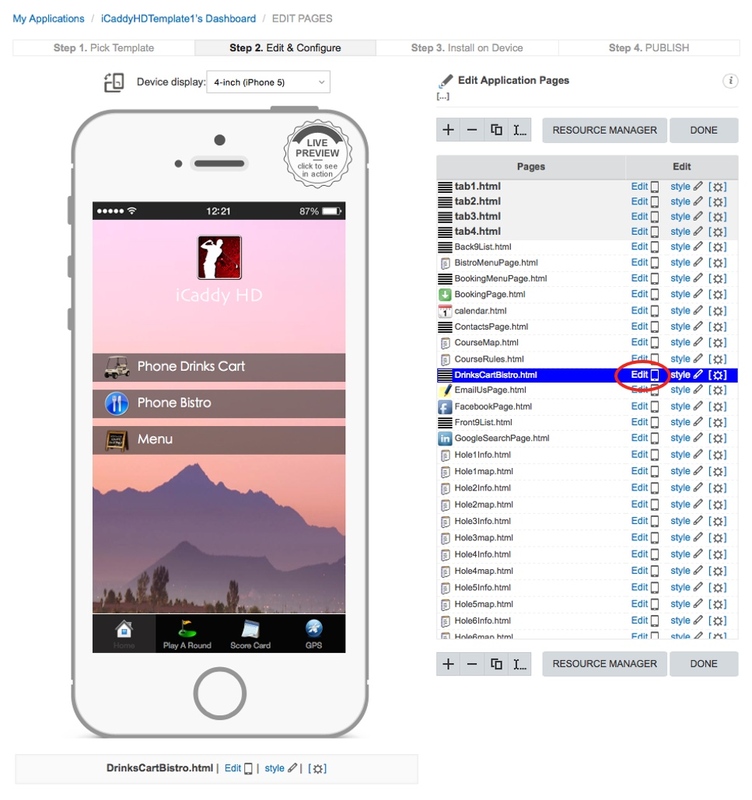 For information on how to add a file to your App, go to How to Add a File to your App's Resources. If you have selected the iCaddy HD 'Eagle' version in order to include hole fly-over videos in your App, the last step of the build process is to add these video files your App's resources.